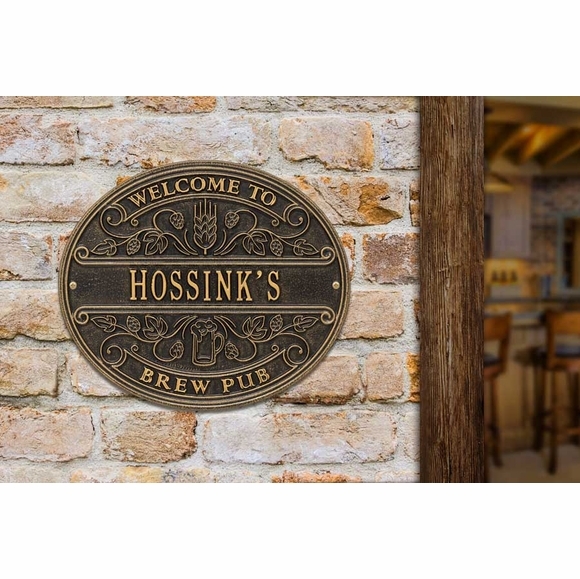 Brew Pub Welcome Sign - - personalized with your name welcomes guests to a personal bar, man cave, she shed, outdoor party space, or local pub. Made in USA. Horizontal 12.5"W x 10.75"H oval wall sign made of handcrafted aluminum. The one line of custom wording in the center holds up to fourteen (14) characters. Character count includes spaces, apostrophes, and other punctuation. The words "Welcome To" and "Brew Pub" and the elaborate central design are standard. Colors: AB antique brass, AC antique copper, BG black/gold, BV bronze verde, OB oil rubbed bronze, OG bronze/gold, PS pewter/silver. Large image color is black/gold. Smaller images (from left to right) are antique brass, antique copper, black/gold, bronze verde, oil rubbed bronze, bronze/gold, and pewter/silver. Alumi-Shield™ coating protects against the harshest weather and environmental elements and extends the product life. Dimensions: 12.5" x 10.75" x .32"; weighs 2 pounds. Mounting hardware and instructions and additional cleaning instructions included. Personalized Welcome To My Beer Pub lifestyle plaque for everyone whose passion is beer and brewing.